Please look over the list of speakers below. By hosting a speaker, you mutually aid both your own community/ecological work and the Earth First! movement, not only creating a great event that underscores your local organizing efforts but also uses your resources to support the work of the Earth First! Journal and its affiliated radical ecological efforts. Your collective, college or university, or nonprofit organization is expected to provide all transportation costs, lodging or lodging costs (where applicable), and an honorarium. Each speaker will then donate from 50 to 100 percent of the honorarium to support the mission the Earth First! Journal, the EF! Newswire and associated projects. Earth First! Journal The EF! Journal has been in print for 30 years as an independent media voice of the radical ecological movement. The Earth First! Journal office is run by a collective of long-term and short-term editors from the frontlines who publish a quarterly journal, newsletter and online newswire. The Journal Collective operates an office that currently acts as a coordination point for the Speakers Bureau as well. Representatives of this collective are available and qualified to speak on grassroots activist media, ecological direct action around the world and the basic tenets of the Earth First! movement. Everglades Earth First! This Earth First! collective based in South Florida has been active for the past 5 years challenging development, mining, biotechnology, environmental racism, industrial infrastructure and corporate globalization. They have become one of the most vocal grassroots groups in the bioregion. 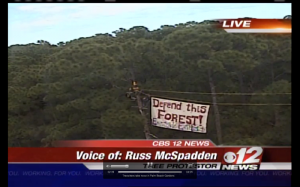 There have been over 50 arrests in EEF!-related actions since 2008 alone, resulting in public relations black-eyes through high-profile media coveragem which have included multiple necessity defense criminal trials against construction the two largest fossil fuel power plant in the country (operated by FPL). The group also maintains strong relations with active rural and urban communities alike throughout the region. The Civil Liberties Defense Center CLDC is a nonprofit organization that strives to protect and educate the public regarding their civil liberties and constitutional rights. They have successfully represented hundreds of political activists in both civil and criminal litigation. The Civil Liberties Defense Center assists communities in curtailing government encroachment upon their right to protest, defends citizen activists in court, assists political prisoners, and monitors governmental attempts to restrict civil liberties and dissent. The Civil Liberties Defense Center strives to educate the public, particularly communities of color and other high-risk communities, by conducting Know Your Rights trainings throughout the country. Root Force Root Force exists to move resistance from the defensive to the offensive. It is a strategic campaign designed to exploit weak points in the global economy and hasten the system’s collapse. Since 2006, Root Force has traveled the country urging local groups to take action(s) against one the system’s major weak points: new infrastructure, particularly infrastructure that brings Latin American resources into the US. Members of the Root Force collective offer presentations that promote anti-infrastructure analysis and action, help plug people into anti-infrastructure organizing (even if there is no local group doing such work), and provide resources to anyone fighting infrastructure. See www.rootforce.org for more information. Tre Arrow Tre Arrow first came to public attention in July 2000 when he scaled a U.S. Forest Service building to protest the sale of an old growth forest near Eagle Creek, Oregon. He sat on a nine-inch edge for 11 days in downtown Portland, bringing national attention to the issue. His protest played an important role in reversing the Forest Service’s plans to log the area. He was also involved with several tree sit campaigns in the pacific northwest and ran for Congress in 2000, receiving 15,000 votes as a Pacific Green Party candidate. Tre also spent 6 years in prison for allegations of sabotage against the timber industry. His case gained international attention during his battle to refuse extradition from Canada to the US. He has appeared in Rolling Stone Magazine, on the cover of book Eco-warriors (pictured below), and even America’s Most Wanted. He was even listed on the FBI’s most wanted in 2002, despite the fact that the actions he was accused of caused no injuries. Tre is a charismatic, passionate and sincere story-telling speaker and musician. He is an example of environmentalists being targeted by federal authorities. He was threatened with decades in prison due to his political beliefs; his case is one of many which have come to be known as the Green Scare. He is a dedicated advocate of sustainable living, environmental preservation, and independence from fossil fuels. Tre, who grew up in Florida, has spoken at conferences, universities and community events across the country since his recent release in 2009. Karen Pickett Pickett has been a grassroots activist for over 30 years, working on issues of environmental justice, recycling, forest and species preservation, and also native rights, protecting civil rights of activists, and alliance building within the labor and environmental movements. She has been active with Earth First! since 1983, when she did her first civil disobedience action in defense of the earth, in the Kalmiopsis Wilderness in Oregon. She has been part of the core organizing in campaigns such as the Headwaters Forest campaign, Redwood Summer, Rainforest campaigns, Berkeley’s Styrofoam ban, and early campaigning challenging World Bank funding of environmentally destructive projects, and is currently working with the Mobilization for Climate Justice and northern California forest campaigns. She is a member of the Board of Directors with the Global Justice Ecology Project, founder and coordinator of the Bay Area Coalition for Headwaters, a member of the Media Alliance, and has recently launched the Roots of Change Media Education Project. leading college classes and non-profit workshops on relevant activist skills including media work and grassroots organizing. Panagioti Tsolkas Current editor on the EF! Journal collective and EF! activist organizer since 1997. From 2000-2004 he was a trainer for the Ruckus Society. In 2004 he ran for the Mayor of Lake Worth, Florida. 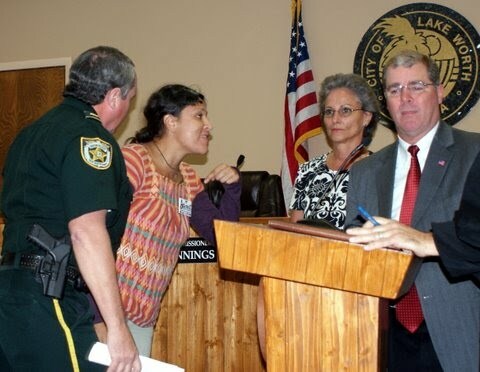 Since 2005, Tsolkas has been co-chair of the grassroots Palm Beach County Environmental Coalition, a group which files litigation regarding development issues in the Everglades. He has been on the planning committee of 4 Earth First! Organizers Conferences (2000, 2006, 2008 and 2011) and in 2009 spent 5 months traveling with the Earth First! Roadshow. In 2010 Panagioti co-founded Uncivil Landscapes, a work collective which creates part-time income opportunities through native landscaping for local activists in South Florida. Tsolkas was named ‘Troublemaker of the Year’ in 2009 by New Times magazine (Broward/Palm Beach edition). He has no formal education past 10th grade; he is diploma-free and proud. Usnea Longissma An activist organizer for over 12 years, working chiefly with forest defense campaigns throughout the Pacific Northwest, including timber sales in Mt. Hood, Willamette and Siskiyou National Forests. She sailed with Sea Shepherd as an engineer for six months and is currently on call as a deck hand with Greenpeace International doing ocean defense and assisting with various international campaigns, including opposition to palm oil plantations in the South Pacific. She spent four months at the Clackamus County correctional facility for civil disobedience in a successful effort to stop old-growth logging in the Eagle Creek watershed. She has also been involved with anti-globalization, prisoners’ issues and animal rights, among others. She works primarily as a campaign-hopping direct action trainer and has recently taken part in organizing and training for campaigns to stop cutting forests in Southern Indiana for superhighways, oppose fossil fuel power plants and development in the Everglades bioregion and protect community gardens in New York City, among many others. In 2009, she was a co-coordinator on a nationwide 5-month Earth First! Roadshow. Her list of trainings includes: Climbing (basic and advanced), blockades (high and low-tech), Consensus/Facilitation, Know Your Rights, Police Liaison. Russell McSpadden Current editor on the Earth First! Journal. As an organizer with Everglades Earth First! Russ has worked on campaigns against development, rock mines, gentrification, environmental racism, capitalist infrastructure, biotechnology, vivisection, boredom and bad jokes. He has also spent a great deal of time swimming with alligators, collecting coconuts, and speaking about grassroots resistance to the murder of the Everglades. His academic background, a Bachelor’s in Literature and a Master’s in Environmental History have made him, at times, incomprehensible and frustrated. Despite that he works like a mule, wears a camo hat, and dreams of cuddling with manatees in the warm Atlantic waters near his home. Ana Rodriguez Former editor of the Earth First! Journal and organizer with Everglades Earth First! and the Palm Beach County Environmental Coalition, and Coalition for Immigrants Rights. She has also been a volunteer with the Inner City Outings program of the Loxahatchee Sierra Club. She grew up in Venezuela and recieved a B.A. in Communication from Florida Atlantic University. She worked 2006-2009 as Master Control of WXEL public broadcast television. She has been arrested multiple times for participating in civil disobedience for ecological and social justice.